I’ve been on a cheesecake kick. That’s in part because I’ve discovered some healthy recipes, which means I should actually be eating it. With these recipes, you can think to yourself: “Did I remember to have my cheesecake?” The way you might think of a multivitamin. If you make it fruitier you can definitely think of your cheesecake that way. Winter is definitely here. Yesterday was a day for long johns, which is the only way to be comfortable and get out of the house when it feels like -24 with the windchill. In Toronto it’s the windchill that gets you. And so it is time to escape somewhere warm…but that’s not in the budget or the schedule at the moment, so food must be the vehicle. 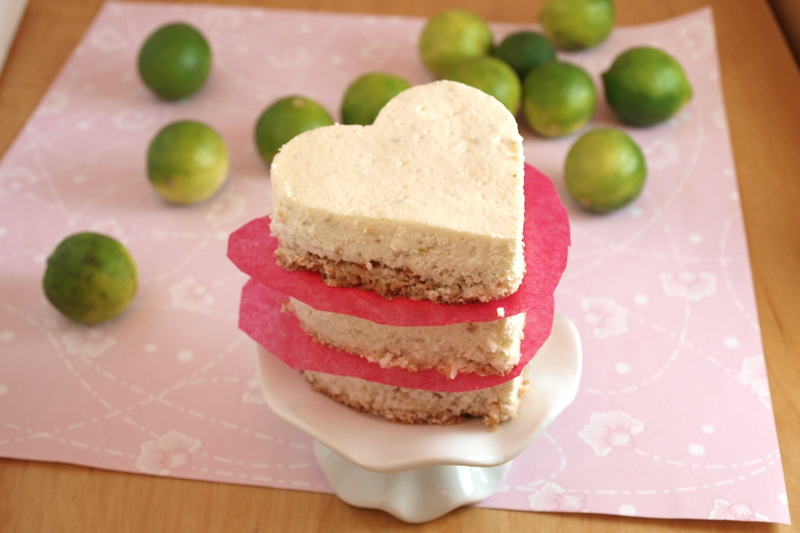 And with that, here are some shockingly healthy key lime cheesecakes. Cut into squares, or use a cookie cutter (beware, this means you’ll enjoy yourself a little too much while eating all the scraps from in between the different cookie cuts. And of course, you can eat these for breakfast. On Valentine’s day. Or any day. Guilt free. Other than the fact that you definitely want to be eating key lime cheesecakes, why else should you make these? if you don’t work out you should. But also, if you don’t work out you should focus on desserts with protein because it fill you up. Desserts that are purely sugary make you crave more. Good for sugary dessert business, bad for your body. refined sugar free…actually, flat out sugar free! These are beautiful. I love the heart shape and the cake itself looks so fluffy and delicious. What kind of greek yo, vanilla or plain? I used plain, but vanilla would work, just cut down on the stevia a bit, since vanilla is sweetened already. Let me know how it goes! What an amazing recipe! I was so torn for a Christmas dessert for my clean eating, gluten green, primal eating family and this is amazing! Thanks for sharing such an amazing treat! My pleasure! I’m so honored you chose it to be part of your Christmas! I hope it was a hit! Yummmmmmmy! Do you think I could make ahead and freeze them? Yeah, I think if you wrapped them really well they should be just fine! Let me know how it goes! It’s totally worth the investment! If you go to Price Winners on Yonge near Wellesley there are often crazy deals.